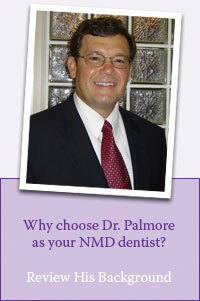 Neuromuscular Dentistry (NMD) is a way of achieving health and beauty through modern dentistry. NMD can bring back your confidence to smile. The following are eight key areas involved in the treatment, diagnosis and discovery of Neuromuscular Dentistry. Click a link or scroll to find out more about each area. Proper health and function depends on the balance of your jaw joints, jaw muscles and teeth. If your muscles win, you have rapid tooth wear. If your teeth win, you will have muscle tension and stress along with headaches and other TMD problems. Or worse, you will experience a combination of the above. An uneven bite can affect your posture by placing more strain on your neck muscles. Furthermore, an uneven body posture, starting from your feet up, can ultimately alter your posture. Therefore, when treating TMJ disorder, the whole body must be considered. What is cause your TMD Problem? What damage has your TMD caused? How TMD can be helped or corrected? Then our treatment helps to restore muscle balance, joint and teeth activity. If you are experiencing symptoms of TMJ/TMD or are considering a smile makeover, and want to know more about Neuromuscular Dentistry, visit LeadingDentists.com - an LVI website.